Members of the Social Security System (SSS) who are employed, self-employed, voluntary, or overseas Filipino workers (OFWs) has an option to save more today so that they can enjoy additional benefits in their retirement age through the Personal Equity and Savings Option (P.E.S.O.) Fund. Considered as a good investment, the P.E.S.O. Fund program will help SSS members to build a secure future through tax-free and guaranteed earnings and benefits; contributions which are placed in sovereign guaranteed investments. To join the P.E.S.O. Fund, an employed, self-employed, voluntary, and OFW members must be below 55 years of age and should have been paying the maximum contribution amount under the regular SSS program. He or she must have paid contributions in the regular program for at least six consecutive months within the 12 months immediately before his or her month of enrollment. Furthermore, members who want to register under the P.E.S.O. fund must not have filed any final claim under the regular SSS program. The minimum amount of contribution is P1,000 while the maximum amount is at P100,000 per year. 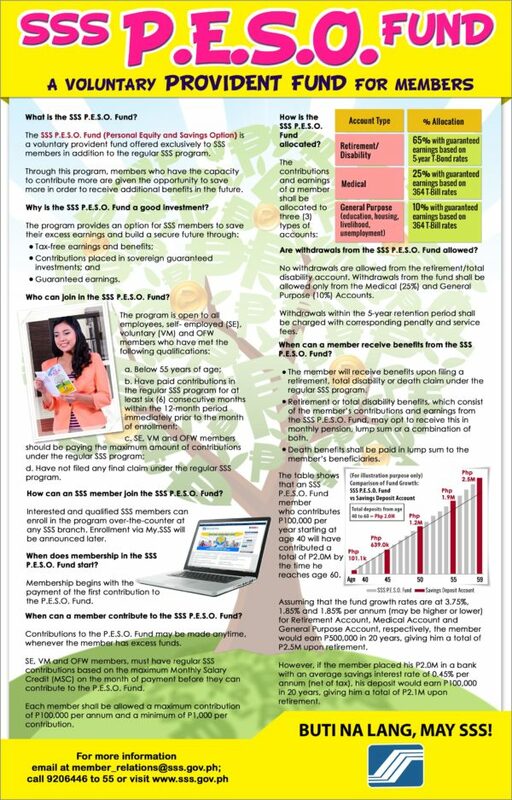 A sample computation from the SSS showed that a member who contributes P100,000 starting at the age of 40 would have contributed a total of P2,000,000 by the time he reaches the age of 60. Assuming that the fund growth rates for the retirement account are at 3.75 percent and 1.85 percent each for medical and general purpose accounts, the member will earn P500,000 in 20 years. At the age of 60, he will have P2,500,000. The contributions and earnings of a member under the P.E.S.O. Fund will be allocated to three types of accounts. Sixty-five percent will be allocated for his or her retirement or disability; 25 percent for the medical account; and 10 percent for general purposes such as education, housing, livelihood, and unemployment. The member can only withdraw from the medical and general purpose accounts only. Any withdrawals within the five-year retention period shall be charged with corresponding penalty and service fees. Those who are interested in being part of the SSS’s P.E.S.O. 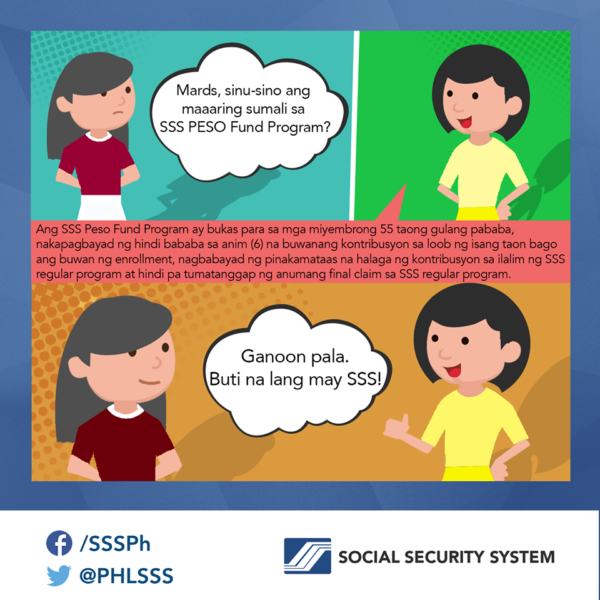 The fund may enroll over-the-counter at any SSS branch.